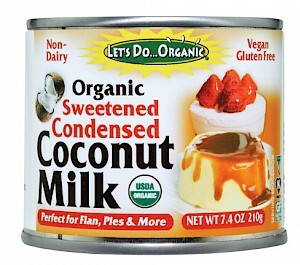 Let's Do...Organic® Condensed Coconut Milk is a HIT! Condensed Coconut Milk is a HIT! So smart and have to wonder why someone hasn't introduced before. With coconut everything, why not a condensed coconut milk for baking and other recipes? This has a great flavor, although I'd like to see a little less sweet. Two tablespoons is 120 calories, 8 grams of fat, 10 mg of sodium and 11 grams of sugars...so in a recipe - especially for baked goods - watch just how much sugars you add.